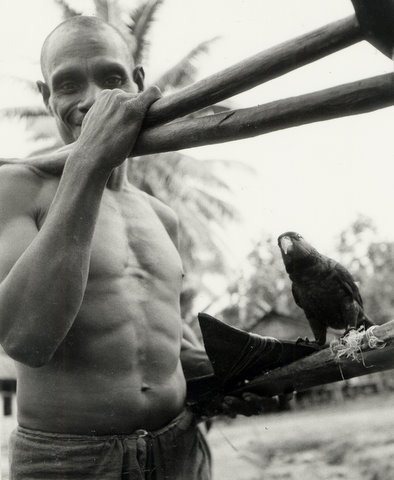 When the fundamentalist Baptist missionaries in this isolated valley in Irian Jaya now West Papua] asked for contributions to build a new church, Zakarias chipped in with the most valuable thing he could find — a bird of paradise. The irony of buying his way into heaven with a bird that represented holy salvation to the early Portuguese and Dutch explorers (the skins the heat-struck Europeans were offered had neither legs nor wings so the Europeans theorized that the birds spent their entire lives in the heavens. The Portuguese called them Passaros de Sol, or Birds of the Sun. The learned Dutchmen who followed, called them “Avis paradiseus,” or Paradise Bird) did not occur to Zakarias. What he did recognize is that everyone, it seems, is after his soul. Zakarias showed me chunky grey caterpillars that nature conservationists encourage him to raise. These will become gaudy, yellow and black swallow-tailed butterflies, and when sold to collectors will earn him a welcome few dollars each. Zakarias, I suppose, calls it a modest business that only recently has begun to pay off. For a couple of years he had undertaken the extra work strictly as an act of faith — he had received promises of a payback, but no guarantees. To the conservationists the butterfly venture represents a philosophy which opines that conservation of the rainforest will work only when local people get some tangible benefit from it. The quid pro quo in this case is that Zakarias agrees to help manage and protect the Arfak Mountains Strict Nature Reserve in the “bird’s head” corner of the Indonesian half of the island of New Guinea. The conservationists are among the most benign of the new religionists. I count at least four nouvelle faiths: the belief systems propagated by the government, the churches, the businessmen and the people who promote nature conservation. The Javanese who run the country from distant Jakarta want to “Indonesianize” Zakarias by encouraging him to speak Bahasa Indonesia; to follow the civic principles of the national philosophy called Pancasila; and to ignore the disruptive free-Irian movement simmering many kilometers and many language transitions to the east. Fundamentalist Protestant preachers want to “Christianize” him, and by doing so add his tenor voice to the Sunday choir. Tycoons who manufacture shampoo and jogging shoes want to “consumerize” him, by making him feel the need for things his people have not needed for millenia previously. And conservationists want to “empower” him, to give him a voice in saving nature, as long as it coincides with the way the experts think conservation should work. And make no mistakes, the four “religions” of government, church, business and conservation have achieved some significant results. For example, some Christian missionaries in Irian Jaya, notably the Catholics, have helped stop cannibalism and infanticide, have established schools and clinics, and have initiated community development projects like water systems and gardens. But the conversions are not necessarily deep. While many people profess to be Christian, of one form or another, it is not uncommon for Irianese to believe that sitting in church will result in immunity from sickness and that forgetting to shut one’s eyes during prayers will lead to blindness. It also seems that many societies out here are retrograde cargo cultists at heart. Sounds like the koreri cargo cult — a widespread Melanesian belief that if proper rites are performed the ancestors will bestow good health, food and material goods –hasn’t died out completely, despite the fact that the good Hatam people of Minyambou raise their voices to Jesus every Sunday, before depositing a sweet potato in the collection box. Clearly the soul is a complicated organ. The day I was leaving Minyambou, I sought out Zakarias to say goodbye. He admired my watch. Seeing that I wasn’t about to give it to him, he offered me a trade: my Casio for a bird of paradise skin. I said a prayer for all of us.